« How Do They Feel? We have a lot of toys that Andrew does not play with (click here for a previous post about new toys) and so I began including these toys as station activities in My Obstacle Course. I do this so I can teach him how to play with them (in case that is why he doesn’t play with them) in small steps, with a good deal of structure and guidance. I think that a lot of times it is intimidating for children with planning issues or delays in pretend or imaginative play to sit down with a blank canvas, like a Lite Brite screen or a toy that comes as a bunch of small pieces needing to be put together to make something, like Legos or Lincoln Logs. Instead of considering those toys to be too difficult or too advanced for him, I removed the “I don’t even know where to start!” factor. I decided to see if starting things out for him would help. 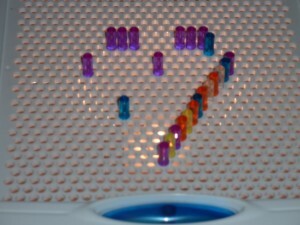 It was near Valentine’s day and he had received a new Lite Brite toy for Christmas that hadn’t been played with yet, so I started a heart so that we could build on from there together. This was so much less intimidating for him because he knew we were making a heart, he could see the general outline, and he could help me fill in the lines. He didn’t have to worry about coming up with the idea or plan and making sure it would be right. I was helping him see that in order to play with this toy, all he had to do was put the little pegs go into the holes to make a picture, shape or just something random. 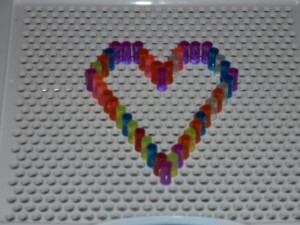 All of the pegs in to make a completed heart shape! 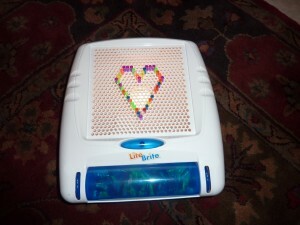 When we finished the heart, he pushed the button, saw all of the colors light up and had the greatest smile on his face! Something so basic as introducing a toy (or reintroducing if they had no interest the first time) by removing steps that could be too frustrating is a great way to encourage your child to play. 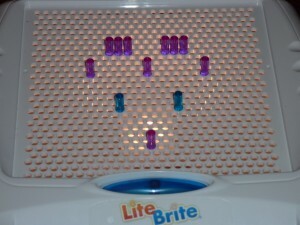 After doing this activity (we did this last year), I “caught” him playing with his Lite Brite many times, using the pegs (or markers as he calls them) to make patterns and also placing them randomly. It doesn’t matter to me if he makes random things, shapes or pictures. What matters is that he learned the basics and realized that he could do it!